Plastic still on pickgaurd. Almost zero use if any. Ernie Ball Music Man StingRay 5 Electric Bass with Case Natural w/Rosewood board no problems with this bass other than light playwear on the pick guard, the case shows wear but is solid with all latches and hinges working. This Music Man Stingray 5 is in Near Mint condition, with an estimated 90% remaining fret life. Hard shell case included. Scale length: 34". Country of origin: USA. Fingerboard material: rosewood. Neck shape: U. The first bass designed by Ernie Ball Music Man, the Stingray 5 was unveiled in 1987 and has been an industry standard for extended range basses ever since. Body Wood: Ash. Neck Wood: Select maple neck. The first bass designed by Ernie Ball Music Man, the Stingray 5 was unveiled in 1987 and has been an industry standard for extended range basses ever since. Neck Width: 1-3/4" (44.5 mm) at nut 2-3/4"" (69.9 mm) at last fret. Body Shape: StingRay. Bridge Pickup: Music Man Neodymium Humbucker. Color: Ivory White. Nut Width: 1.75". Case Included: Hardshell Case. Scale Length: 34". A nod to the Ball Family Reserve series of StingRay basses, the Sterling by Music Man StingRay "Ray35" features a 3-band active preamp, modern contoured body and a bridge modeled after the iconic Ernie Ball Music Man StingRay. This beautiful bass is in perfect condition. Played out a few times. I just have too many and some have to go! Comes with soft shell gig bag. Ernie Ball MUSIC MAN STINGRAY 5 V natural (1998) with hardcase! Bass is in exellent condition.Body has a little wear sings that can be polished. Made in San Luis Obispo California, USA Serial E00976. Bass was bought in London 8/14/1998, i am the second owner. Not longer a 5 string player, so my lose is your gain. Bridge: MusicMan Bass Bridge. String: ERNIE BALL 5 STRING BASS Slinky (#2836). (But it usually doesn't have any blemishes.). Neck Width: 44mm at Nut, 70mm at Last Fret. Switch: 3-Way Lever (Series / Single / Parallel). 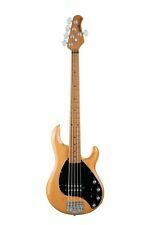 Sterling by Music Man StingRay Ray5 Bass Guitar in Satin Walnut. As with everything in life, we also have limits, here are a few. Used Gear is sold as is. No exceptions. MUSIC MAN StingRay5 Stealth Black Free Shipping!! Fingerboard: Ebony. Neck: Current status straight. Truss rod: There is an extra half turn. Sorry for your inconvenience if that's the case, I hope you will get this guitar by early decision. Neck joint: Detachable (bolt on). The first bass designed by Ernie Ball Music Man, the Stingray 5 was unveiled in 1987 and has been an industry standard for extended range basses ever since. The bass has been set up and gone through by our in-house luthier, who went through the bass with a fine-tooth comb, giving it an amazing setup. MUSIC MAN StingRay5 w / Piezo - Dropped Copper Used. Finger plate material: Rosewood. Pickup: Active. Accessories: Hard Case. Number of Frets: 22 frets. Overall this is in very good condition. MUSIC MAN Stingray 5 HS Black / Rosewood Used. Finger plate material: Rosewood. Neck is straight. Truss rod works properly. Color: Black. Accessories: Hard Case, warranty. Pickup: Active. Number of frets: 21 fret. • Material: Ash, Maple. •Neck : Select maple neck. •Fretboard : Maple. •Body : Ash. • Neck: Straight. • Truss rod: Works well. (It may be non-original. •With/Hard Case. ). This machine is a 5-string model! Asia, Middle East. Accessories: Original Hard Case. Even if you think to yourself, "But the item I want is only available in Japan.". We will look for and suggest the best products on your behalf. • Material: Ash, Ebony, Graphite, Maple, Rosewood. • [Body] Ash [Fretboard] Ebony. Fingerboard Fretted - Maple,Rosewood,or Ebony (dependent on body color). Switching Single Pickup - 3-way lever pickup selector; Dual Pickup - 5-way lever pickup selector. Just got fresh strings and a pro setup. Strings: 45w-65w- 80w-100w-130w (Super Slinky Bass 5 #2836). - The picture is a representation of the product. Neck Radius: 7.5' (191 R). Neck Width: 1-3/4' (44.5mm) at nut 2-11/16' (68.3 mm) at last fret. • Material: Ash, Ebony, Graphite, Maple, Rosewood. Fingerboard: Fretted - Maple, Rosewood, or Ebony (dependent on body color). Switching: 3-way lever pickup selector. Body Wood: Ash. Neck Wood: Select roasted maple neck. MUSIC MAN stingray5 Used. Pickup: Active. Color: Sunburst. Body Colors: Trans Buttercream. • Material: Ash, Graphite, Maple, Rosewood. • [Body] Ash [Fretboard] Rosewood. Fingerboard: Select Rosewood. Body Wood: Ash. Switching: 3-way lever pickup selector. Neck Wood: Select roasted maple. EMS is safe, fast (approx. Play condition is good. No playability issues. Ishibashi Music Corporation. All Right Reserved. ). Electrical circuit : No problem. Neck : Straight. Easy to play, it is a very good condition. Neck condition is also good. •Pickup: Music Man humbucking. • Neck: Straight. •Switch: 3-Way Lever (Series / Single / Parallel). • Truss rod: Works well. (It may be non-original. • This item is in very good condition overall. (very lightly used). ). In addition is the Stingray five-string specification the width of the sound is spread! In addition to the 3Band EQ, series, series with Filter, equipped with 3Way pickup selector parallel of sound can be obtained. The picture is a representation of the product. •Pickup: Music Man humbucking. •Switch: 3-Way Lever (Series / Single / Parallel). - The price is set depending on the market price in Japan. We will cancel the order in case our export application is rejected. 3Band EQ and Series, Series with Filter, Parallel. 3 way PU selector. 5 string model. Active circuit, 1 humbucker type. Operation checked. Operation check, cleaning processed. There are scratches, rusts, & dents. Operation check, cleaning processed. It is with a genuine hard case. There is also no buckle marks and the peg only has a little Kusumi but the parts are kept in shiny condition, and small dent marks are only super high quality USED goods in only a few places.